Cpl Andy Webb has just gone solo at Dundee Airport after 7 hours of flying training. This is the third FS the Sqn has gained in the last month in spite of the Winter Weather! Whilst the Recruits were at Crowborough AWO Morris lead the Sqn’s Teams to the Annual Wing 5 a Side Footbal Tournament. Whislt the Junior Boys were soon knocked out the Senior Boys and the Girls went through to the finals, and whilst the Boys lost the Girls won. Well done to all participants. Recruit Course 48 attended Crowborough Training Camp in Sussex over the weekend of the 25 – 27 Feb 05 for their attempt to gain the Sqn’s Black Witch Badge. The Cadets took part in a variety of activities, including Drill, Camp Assault Course, Natural Obstacle Course, Navigation Trg, and a Night Navigation Exercise on the Training Area. The weahter was grim, with both of the early morning runs being in snowy conditions, and several miniblizzards were experienced on Sunday. However all Cadets passed the Course and were awarded their Black Witch Badge. Special congratulations go to Cdt Pierce who was selected as the Best Cadet of the Course. He will recieve his Trophy from the CO tonight. Congratulations to CWO Holly Brogden-Knight who has been appointed as a Lord Lieutenants Cadet for Great London. This honour is for her outstanding service to the ATC over the last seven years. The Lord Lieutentant is the Queens Offical representative in Counties and Cities, and appears on her behalf at many ceremonies and investitures. Holly will spend the next year assisting him at these events, and will be awarded a special badge to indicate her status. In addition FS Paul Fothergill has been appointed a Deputy Lord Lieutenants Cadet for the Borough of Redbridge, which has a similar role at Borough Level. He will recieve his award in March at Redbridge Town Hall. CWO Nic Hanson has just passed a Wing Board for promotion to Adult Sergeant. This means he will some be joining the Adult Staff of the Sqn and will become offically responsible for training the Cadets on the Sqn. Well done! Cadets attended a shooting practise at Pirbight Ranges on 20 Feb 05. After a bad start as the range had been doubled booked we were able to get two ranges up and running including a Falling Plate practise. 20 Cadets from the Sqn visited RAF Lyneham in Wiltshire, home of the RAF’s Hercules Fleet on Thursday and Friday of the Feb half term. They visited 30 Sqn and were given a guided tour of the new C130 J model Herc by two pilots, the Tactical Medical Wing and medics, UK Mobile Air Movements Sqn, 47 Sqn Air Dispatch RLC (an Army unit who prepare parachute loads) who showed some spectactular footage of when it all goes wrong! Air Traffic Control, Fire Section and others. Cadets also gained work experience in the Engineering Section, Armoury, and with the Aircrew. Some cadets were also able to ‘fly’ on simulator missions. In the evening the cadets went bowling and to Laser Quest, where we were joined by some Scouts who where younger and much better at getting ‘kills’! Recruit Course 49 is well underway! 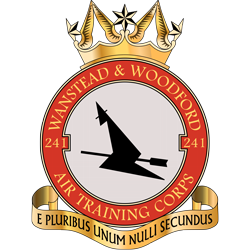 There are just two weeks to go before the recruit course closes for this course, so bring your friends or anyone who wants to join to the squadron ASAP!! The recruit course times are 7.15pm til 9.30pm Wednesday! On Saturday 05 Feb Sgt Jerome ran a Navigation Training exercise in Epping Forest for Cadets studying for their Leading Cadet Exam. This is practical training with map and compass to equip cadets for their exams and for their Bronze Duke of Expeditions in the summer. 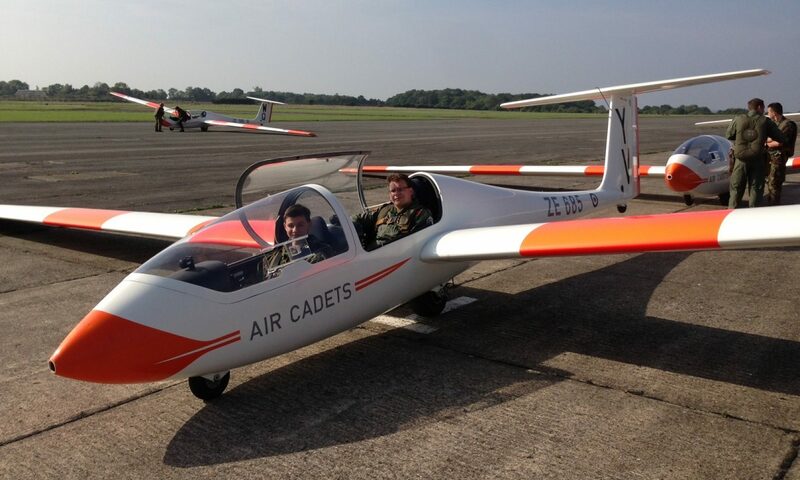 On the same day Cadets from 3 Flight started their training for the MacGrath Competition (to find the best Section on the Sqn) – will they win this year? On Sunday 20 cadets attended ATC Sunday, a formal parade of over 500 cadets from London and South East Region, which involves a parade down the Strand in Central London followed by a church service in St Clement Danes, the RAF chuch. and lastly Fg Off Harvey is on a Winter Mountaineering Course in Norway with the British Army, probably the first member of staff in the Corps to do such a course! The new Wing Commander of London Wing, Wg Cmdr Sylvia Silver, visited 241 Squadron on Monday 31 Jan 05 to carry out the Annual Inspection. There she saw the Squadron on a typical parade night and meet some of the 127 cadets on parade. On Final Parade she presented FS Paul Fothergill with his Flying Scholarship Wings, in front of his father who was a cadet on the squadron some years ago! She also presented a BTEC First Diploma in the Public Services to Cdt Samuel O’Brien, and a Jack Petchey Award for £200 to Cdt Adelaide Glover who was the Best Cadet in her Flight for January. The Wg Cmdr was undoubtedly impressed with what she saw, and certainly gained a good first impression!